Nose: Young and corn forward, some vanilla and corn stalk. Taste: Like bourbon flavored water. There's not much to this bourbon. Thin and watery. I wouldn't have even thought this was a wheater cause there is almost no sweetness. Finish: A slight tingle on the back of the tongue. Overall: 78. 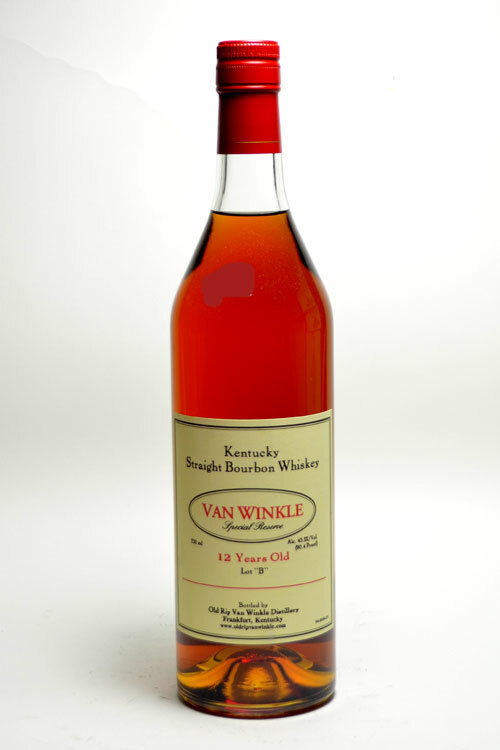 When I found out the identity of this bourbon I was mildly shocked. I've always like ORVW 10/107, but then again, I've always known what was in my glass. Parker's Heritage Collection is a highly sought after annual release from Heaven Hill distillery. The Heritage Collection allows Parker and Craig Beam, the father-son Master Distiller team at HH, to really explore the studio space in the Heaven Hill rick houses. In past years, they've released a wheated bourbon finished in cognac casks, an ultra-aged bourbon (27 years) and a cask proof wheated bourbon among others. Nose: Cinnamon, orange peel, and a whiff tobacco and leather. I can tell from the nose that this is a complex bourbon. Taste: A maple sweetness on the tip of the tongue upon entry. As it moves across the tongue, I got some traditional rye spiciness, and on the back of tongue I got more of the pleasing sweetness usually associated with a wheater. Finish: A nice complex mix of spice and sweet. Overall: I rate this at 89. This improved a good deal after I opened. When I first tasted it a few weeks ago, I did not care for it. After opening up some, it seems to have improved. I'd be interested to taste this blind, since I know what's in it, I know what to taste for. It would be interesting to see what I could pick out not knowing what it is. All that said, it isn't as good as some of the Parker's Heritage Releases, though I haven't tasted them all. The 2011 cognac barrel finished bourbon is one of my all time favorites, but this one does not reach that level. It's a good bourbon though, and and if you can find for around $70, I think you should buy it. I bought two; one to drink and one to bunker. The Capitol Bourbon Committee is conducting a Four Roses blind tasting on Saturday, so Thursday night my wife and I transferred the Four Roses into bottles so that it would be blind. 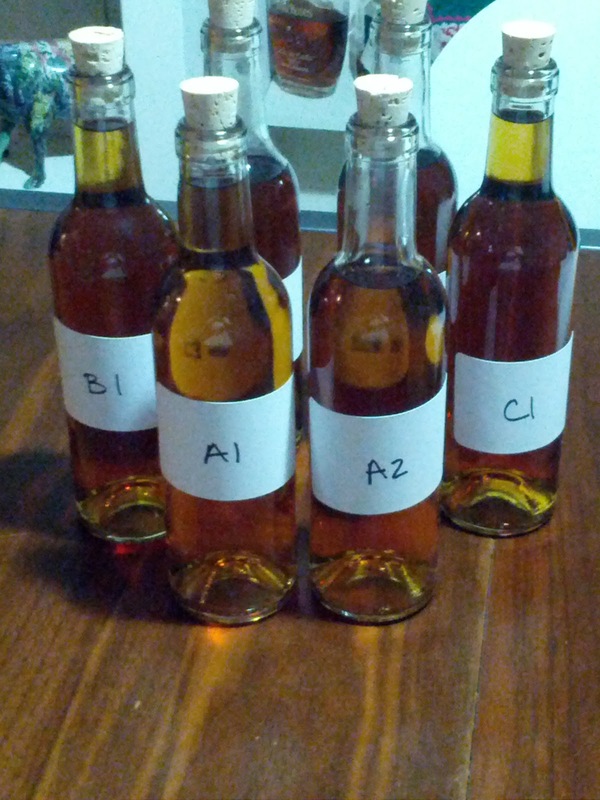 I poured the whiskey into smaller bottles and my wife labeled them while I was doing some dishes. The bottles labeled for the blind tasting. This will be the first tasting to include all six members, and we'll all be rating each whiskey blind. 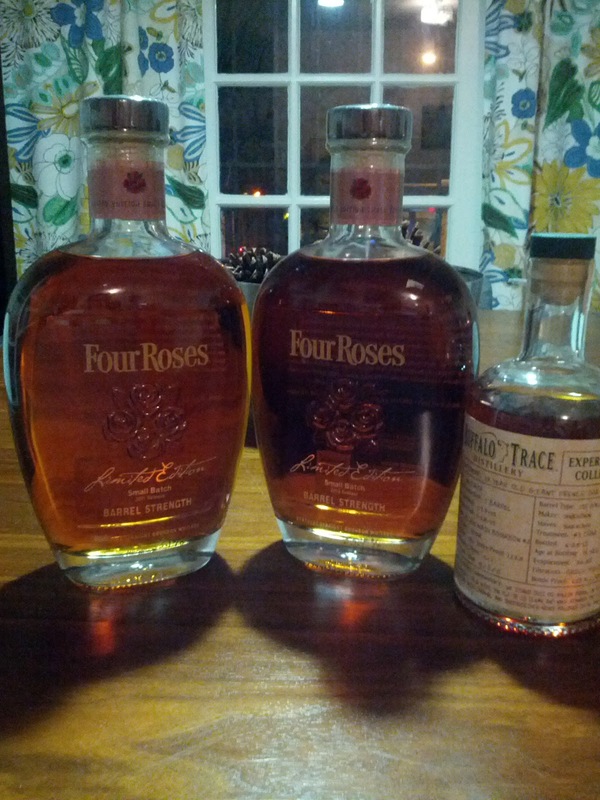 On tap are Four Roses Yellow Label, Small Batch, and Single Barrel. I'm hoping that we have slightly different preferences so we can all take home a bit of the whiskey we liked the best. 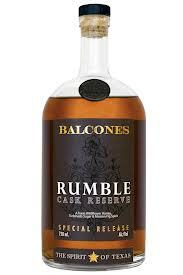 On Tuesday I had the distinct pleasure of tasting a sample of Balcones Rumble Cask Reserve. If you aren't familiar with Balcones, you should be. 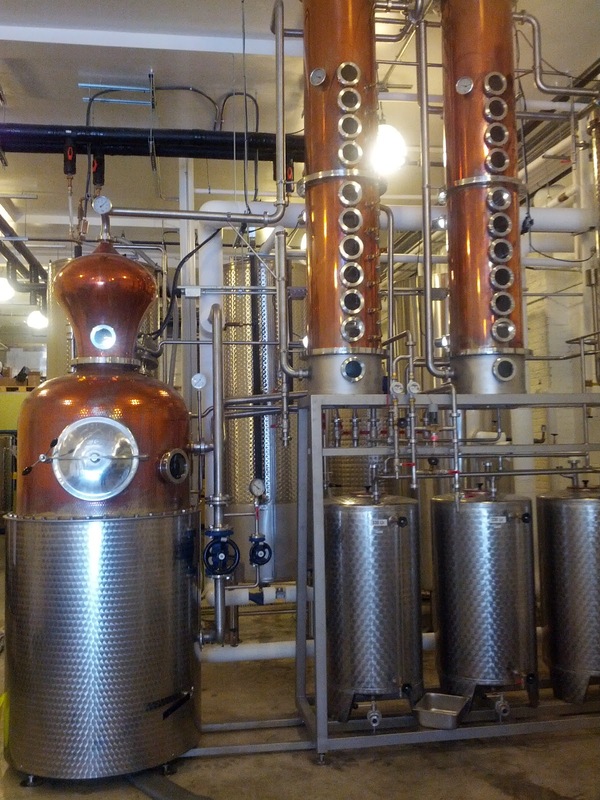 Balcones is a seriously up and coming micro-distillery out of Central Texas. They have pretty good market penetration here in Washington, DC, as their products are available in many of the higher end liquor stores around the city. Rumble Cask Reserve is a cask strength version of Rumble. It is a seriously unique whiskey, if that's what it can be described as. It is a spirit made from "...the finest local wildflower honey, mission figs, turbinado sugar, and natural Texas hill country water..." They age the spirit in a small barrel, which can be a double edged sword, but they've pulled this one off. Nose: Honey, some grassiness, and a sweet note that I couldn't quite place. It's floral/honey notes got stronger the more I nosed it. Taste: A very full mouth feel upon entry, with the honey notes prominent. Tastes almost like a sweet scotch as it has some of that earthiness often found in scotch. On the second sip I got some barrel influence that nicely balanced out the sweetness. I also got some honey wheat bread flavors. Finish: The finish lingered on the horizontal middle of my tongue. It was like a small honeycomb was just sitting there. Overall: I rate this out as an 88. I think this is something of a mood spirit that almost directly splits the difference between bourbon and scotch. It's sweet but earthy, and I'll be picking up a bottle soon. Many thanks to @Connoissaurus for sending me the sample! Anyhow, when I first tasted JPS18, I didn't like it. In fact, I hated it. Since I didn't like it, it sat on my shelf, untouched, for several months. At some point, I gave it another shot, and the bourbon had changed. After some time it opened up and I really really enjoyed it. At some point, Gulliver came over and we shared a pour or five of it. Gulliver liked it enough to purchase his own bottle. Until very recently, I hadn't really thought about it. 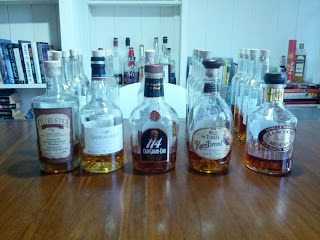 But as part of another bourbon group, I'm taking part in a 21 wheated bourbon blind tasting. Two bourbons are revealed weekly. Long story short, I rated JPS18 a 95, which is the highest I've ever rated a bourbon. 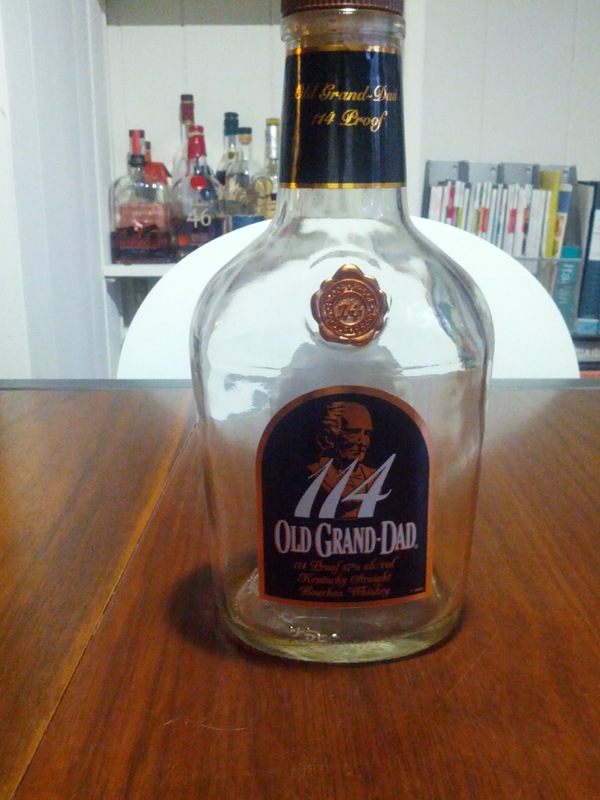 At the same time, Gulliver commented to me how much he enjoyed this bourbon. I try to keep an eye out on area and online liquor stores to keep a pulse on prices. In the DC area, I've seen JPS18 go for as much as $105, so when I saw it online for $69.99, I knew I had to jump on it. I emailed the group and Kyle and Gulliver were both interested in getting a bottle (In Gulliver's case, two). Today, the bourbon arrived, and man is it a pretty sight. 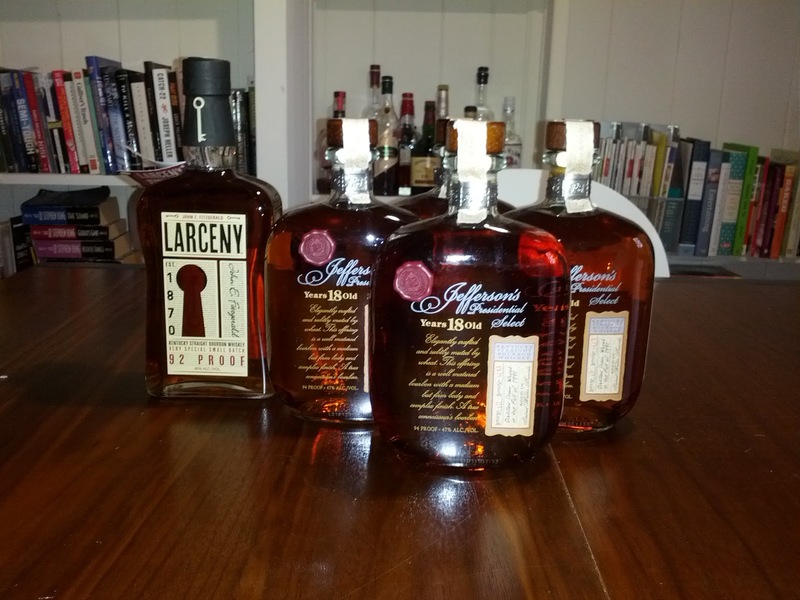 The other bottle along side the 4 JPS18s is Larceny from Heaven Hills. It is a new brand that came out in the last few months but has not yet arrived in DC. I'll have notes on it when I get around to opening it. For now, though, the Committee is going to enjoy some JPS18. My wife and I took a little Saturday afternoon drive today to hit several DC liquor stores. I wasn't looking for anything in particular, although I was kind of wondering if any store had some of the sought after Buffalo Trace Antique Collection yet (sadly, no). 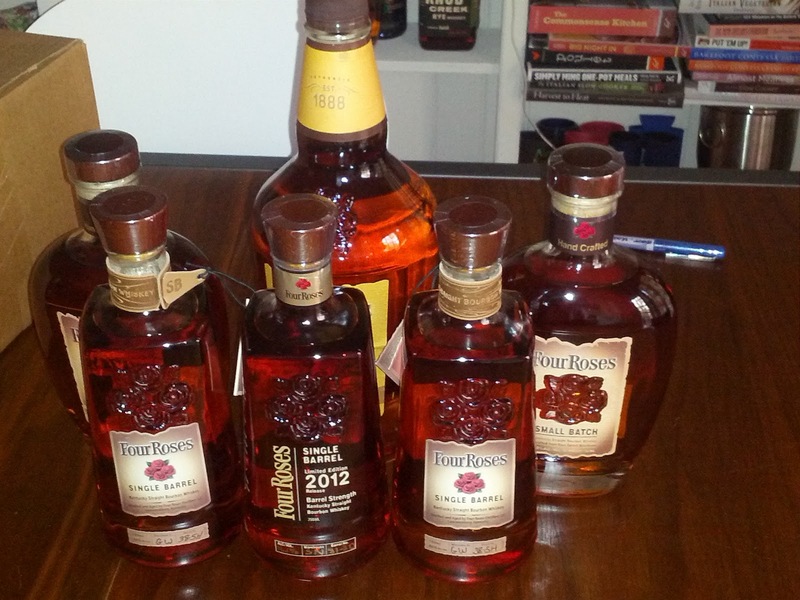 One reason I like bourbon hunting is to get a good handle on the prices in the area. For example, a bourbon I really like, one that I bunkered, is the E.H. Taylor Tornado Surviving Bourbon. I bought my first bottle at Pearson's for $79.99 and the bottle I bunkered I bought at Schneider's of Capitol Hill for $69.99. One store I stopped at today was selling the exact same bottle for $101! Either my bottle has increased in value very quickly, or that store is trying to rip me off! 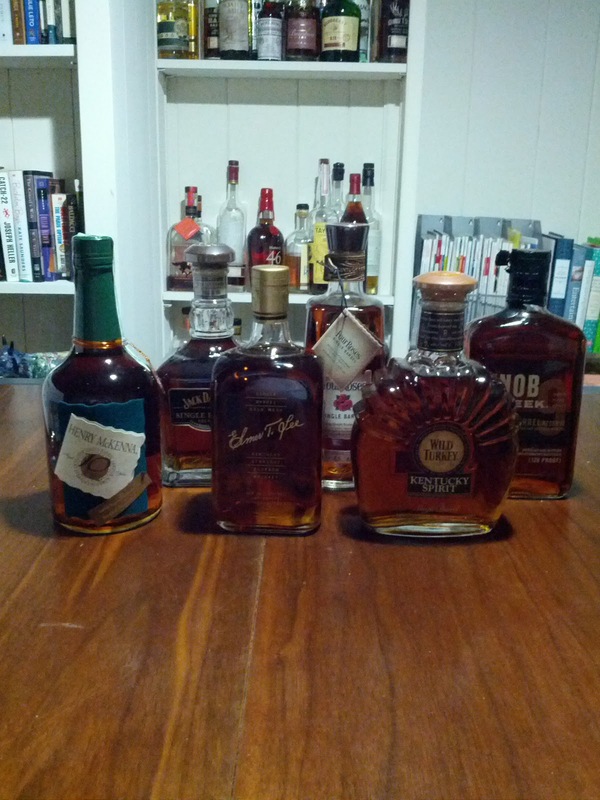 Basically, I just like knowing what everyone is charging for bourbon. 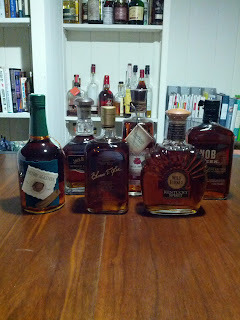 I didn't end up buying any bourbon, despite visiting six stores. I did buy a couple of beers. One, Allagash Curieux, is maybe my favorite beer. Ironically, I found a great price for it at the same place I found the $101 bottle of E.H. Taylor. Nicole picked up some Pumpkin beer, though I've been getting into pumpkin lately too. 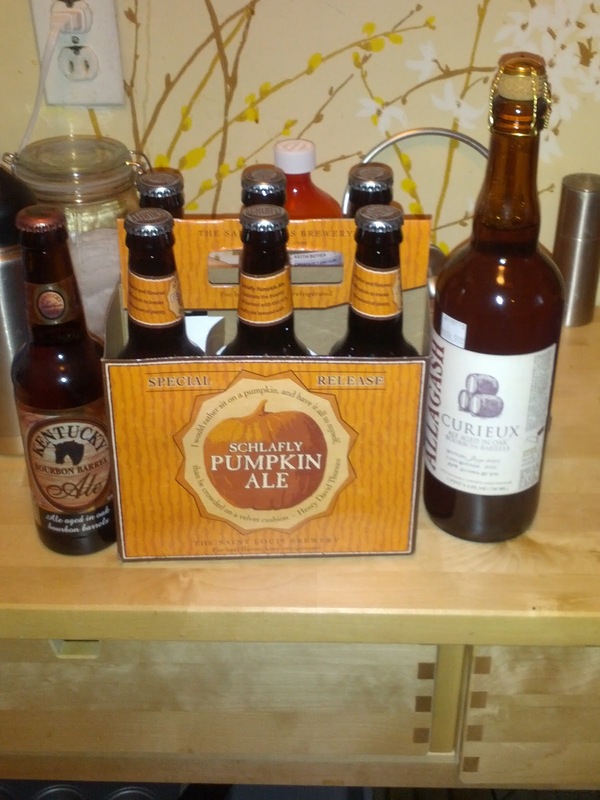 I also picked up a 4 pack of Kentucky Bourbon Ale. The Allagash and the Bourbon Ale are both aged in bourbon barrels, so, you know, close enough. The committee recently (mostly) finished up tasting our August bourbon allotment. 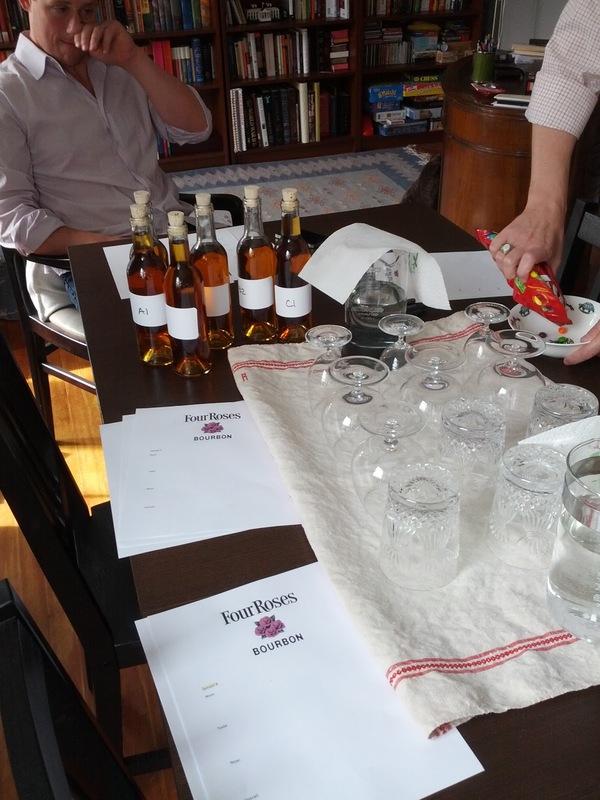 The notes are somewhat haphazard as we haven't quite figured out the best way to organize the tasting notes. Our August allotment consisted of Fillibuster, Wild Turkey Rare Breed, Hancock's President's Reserve Single Barrel, Leopold Brothers American Style Whiskey, and the already reviewed Old Grand-Dad 114. The line up for August. KB: This is a whiskey of indeterminate origin that is finished in White Wine Seasoned French Oak barrels. 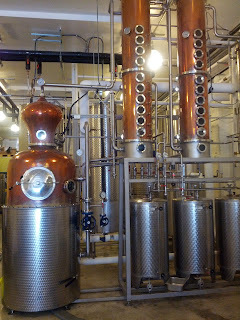 Mashbill is 75% corn, 21% rye, and 4% malted barley. That finishing and mashbill is on the back of the bottle. It does not have an age statement, nor does is say how long the bourbon was in the French Oak. Nose: A vanilla bomb with some orange peel and citrus, but something just smells off from the start--maybe not off, but just not "normal" for bourbon. Taste: Vanilla and oak, sharp and thin on the tongue. I'm not sure if something can be cloying and astringent, but this seems like a candidate. Finish: Short, but oddly it hangs around on the tip of my tongue. Overall I, well, hated this one. 72 overall. KB: Nose: Caramel, butterscotch and a spicy rye forward note. Some cinnamon and spice. 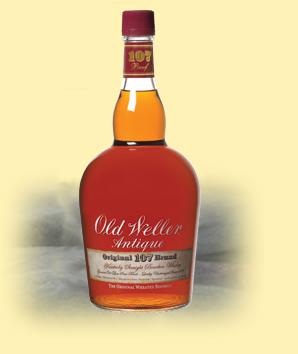 Taste: Hot and spicy--this is the jalapeno pepper of bourbons. It "pops" in your mouth. I get some cinnamon and maybe some maple. Finish: Surprisingly sweet with subtle spices underneath. Overall: This one is an 85. I like it best of all the Wild Turkey expressions (though I haven't had the WT Tradition). It's relatively high proof--108.2*--so it'll get you drunk. Finish: Medium--lingers a bit on the mid and rear palette. Overall: First I have to admit that I know just a bit too much about this bourbon to be objective. It is from the Rock Hill Farms and Blanton's family which Buffalo Trace distills on contract for a Japanese company called Ages International. 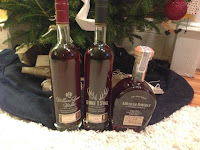 All three are made from their high rye recipe (~30% rye), are single barrel, and none have an age statement (if I'm not mistaken). The only obvious difference between the three is the proof. Overall 87. With all that said, Rock Hill Farms is one of my favorite bourbons--I can barely keep the damn thing on the shelf. I quite like Hancock's too, especially when I can buy it for $29.99. I've seen it retail here for $50+. 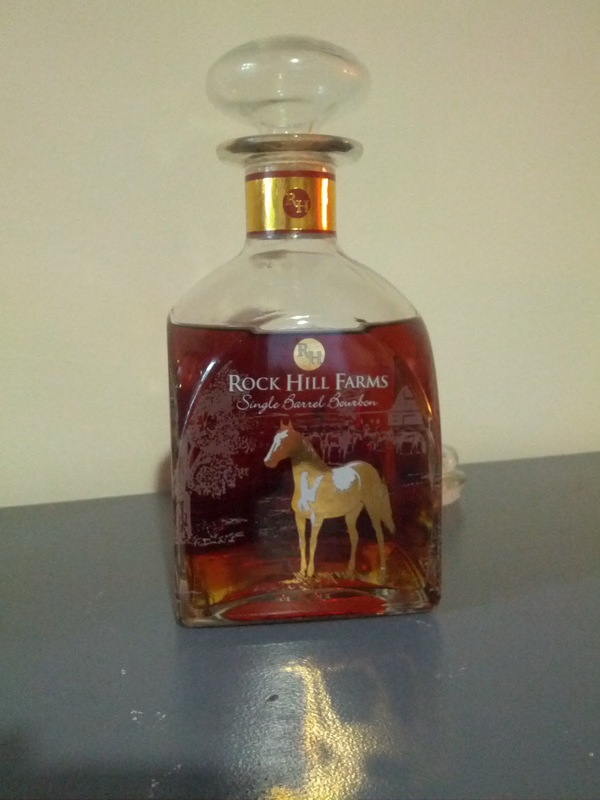 If you're willing to spend that coin, buy Rock Hill Farms as it is 100 proof and just over $50. I'd rate this an 86, assuming that it is $29.99. If it is a $50, you should expect a bit more (just buy Rock Hill Farms already!). JF: Color and nose: A darker brown with hints of red and a golden meniscus. The nose is crisp and fresh with some fruits (Currants? Banana? ), a small amount of flower (mainly rose I believe, but I’m not a botanist), marshmallow, and fresh rain. Taste and finish: A very round flavor of oak and mild spices and traces of the floral. Exceptionally smooth and mellow. Flavors round even further to an earthy finish of grass, a recently wetted wood. and nuts. 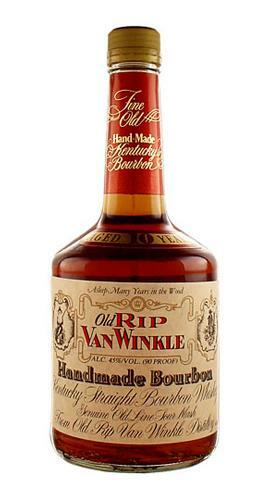 Overall: A mild sipping bourbon that is very pleasant throughout, aided by the moderate alcohol content. The crisp nose compliments the round and natural taste and finish very nicely. While a delightful bourbon, the balance of Hancock ensure there are no fireworks here. A good, solid buy for every-day use. 89. KB: Nose: Grassy and young, with some mint and corn stalk. Smells young, kind of white dog-ish. Taste: A decent rye spice on entry. Very crisp and mellow-ish, and I'd say it tastes older than it looks and smells. But still very thin on the palette and not well balanced. Kind of watery. Finish: Some pleasant spice, but not a whole lot going on here. JF: Color and nose: A very light amber, noticeably so when juxtaposed with the bourbons. The nose is a bit boozy and medicinal of the old-timey recipe style that seems to be in fashion. Behind this are faint hints of fruit, mainly pear, apple and grape and quite a bit of raw corn in the husk. Taste and finish: In spite of its strong nose this whiskey falls flat on the tongue. There is a hint of nondescript spice and some more of the corn husk. But these qualities dissipate into an alcohol burn before finishing with a light limestone and grassy aftertaste. Overall: This whiskey is entirely too young for distribution – another 2 years or so would provide the flavors necessary to overcome the overall boozy penumbra surrounding it. This whiskey has more in common with other bottles that are more pure to 19th Century distilling techniques such as Ransom Old Tom Gin than it does with any whiskey of the post-Prohibition age. Leopold Bros would likely make a good cocktail whiskey. 75.